So many ways to help learning stick! Sticky notes got their start nearly 40 years ago, when 3M introduced the now-classic yellow Post-it Notes. In the years since, their popularity has skyrocketed, and they’re now available in every shape, size, and color you can imagine. 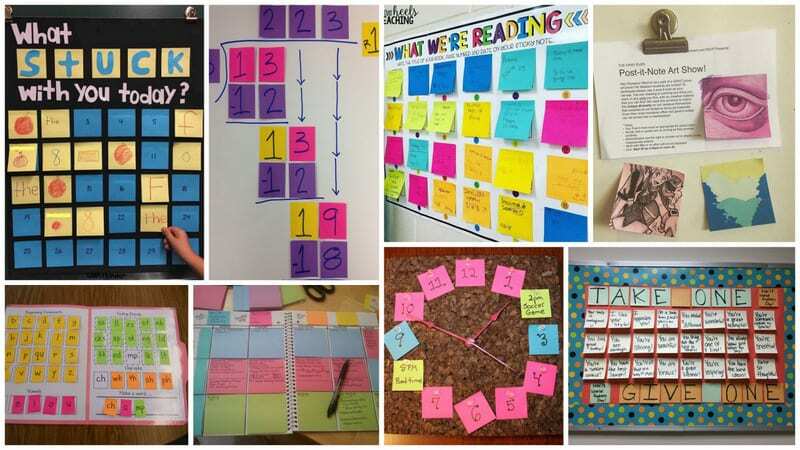 They have endless applications, especially in schools; teachers use sticky notes for math, reading, art, planning, and so much more. 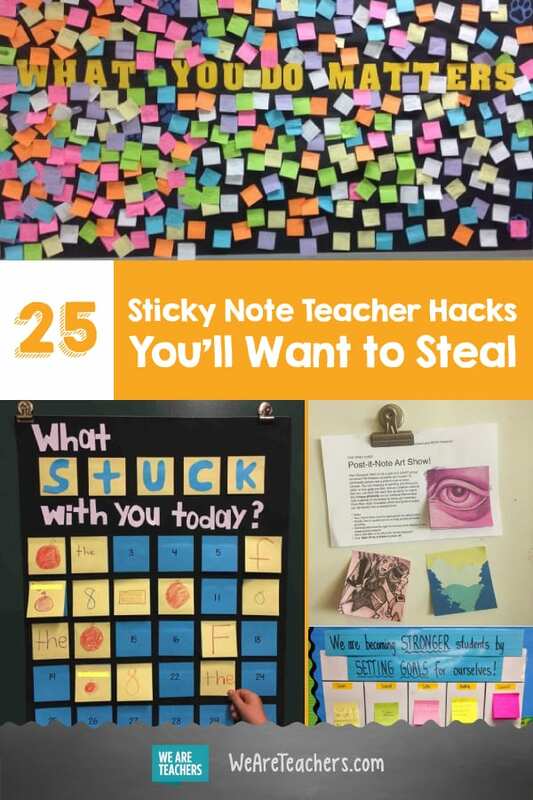 Here are 25 clever ways to use sticky notes in the classroom. Bonus Tip: Did you know you can easily print on sticky notes? Check it out below. Plus get our free templates here. 1. Share what they’re reading. 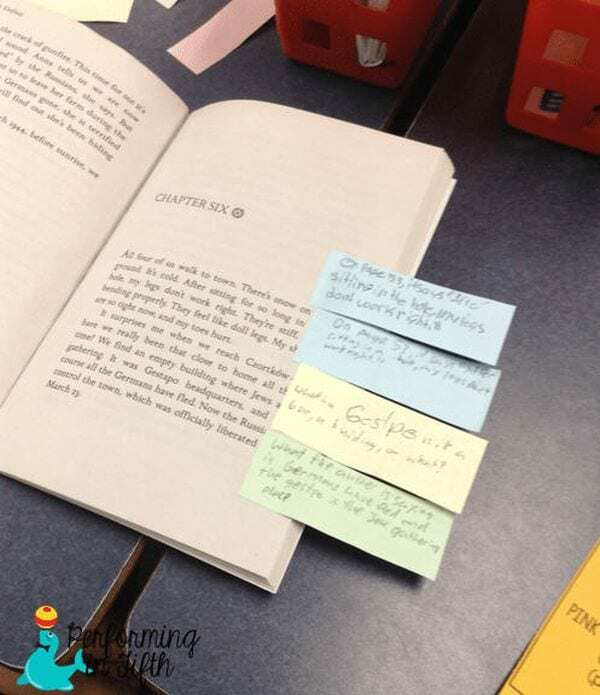 Have students write the title of the book they’re currently reading on a sticky note, including the date and page number they’re on. As they finish each book, ask them to rate it and indicate whether they’d recommend it to their classmates. 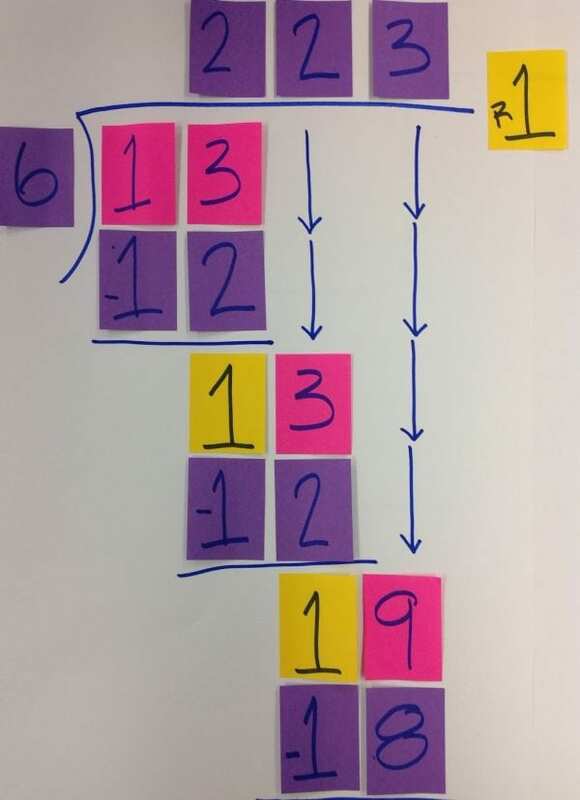 If dividends, divisors, and differences are confusing your students, help them connect the dots using sticky notes. This hands-on method shows exactly where each number comes from, using color to help guide the way. More info at the link below. 3. 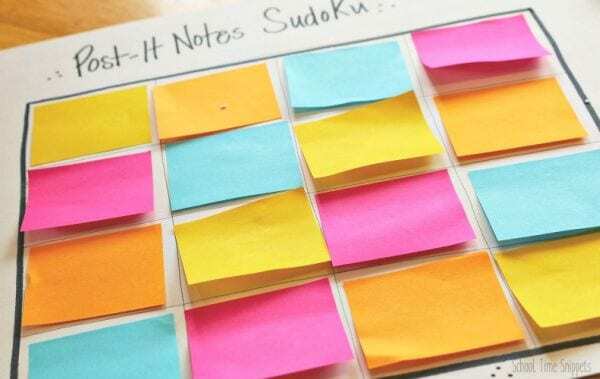 Play sticky notes Sudoku. This modified version of the popular numbers game is great for younger kids. For older kids, increase the number of colors and the size of the grid or write numerals on the sticky notes instead of using different colors. Art meets math as students measure, graph, and create their works of art using sticky notes. Each student can do their own, or have them work in groups to create larger masterpieces. This works for any kind of writing, but names are a good place for very young kids to start. First students match the letters, then they practice writing them on sticky notes. 6. 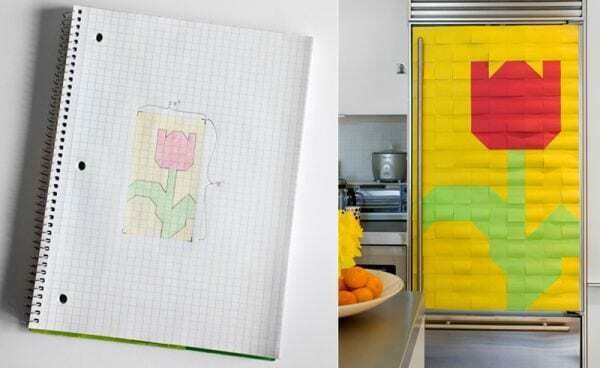 Make sticky note words. 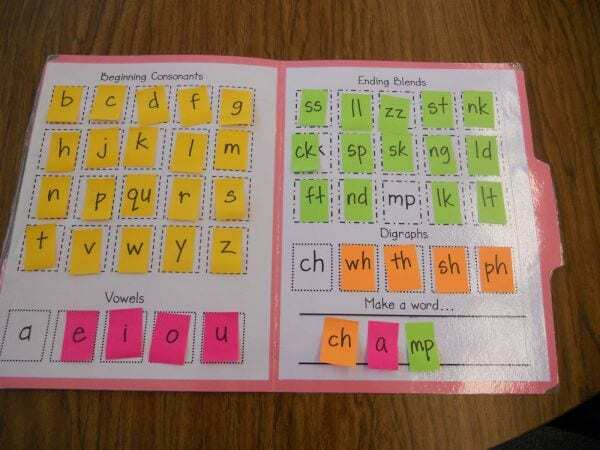 Making words is a fun way for kids to learn sounds and spelling, but letter tiles or cards are easy to lose. Use sticky notes instead—they’re a lot easier to keep track of. Get free printable templates at the link below. 7. Post it and prove it. Check students’ grasp of the concepts you’ve just taught by requiring an “exit ticket” on their way out the door. 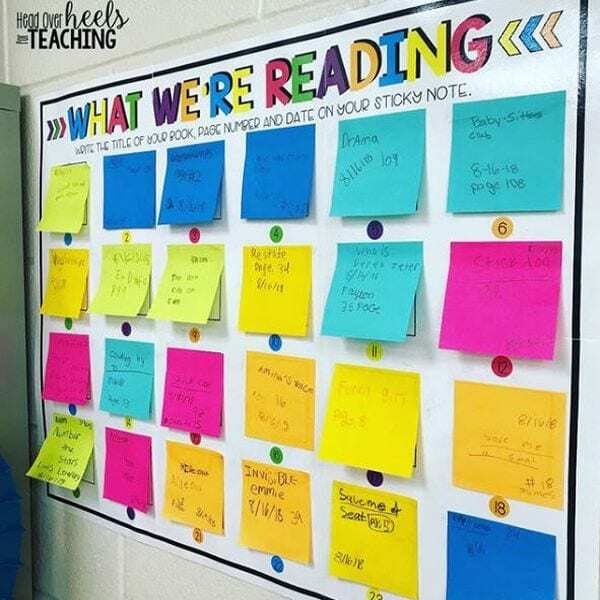 Give them a question and have each student write their name and answer on a sticky note, posting it to the chart as they leave. Afterward, you can review the answers to see who got the concepts and who needs a bit more help. 8. Set classroom or individual goals. 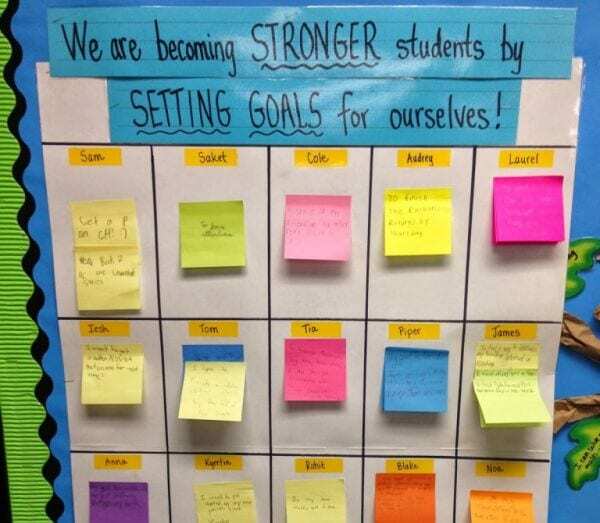 Challenge students to set goals, for themselves or for the whole class, and post them as reminders. Move achieved goals to a different chart and celebrate success. 9. 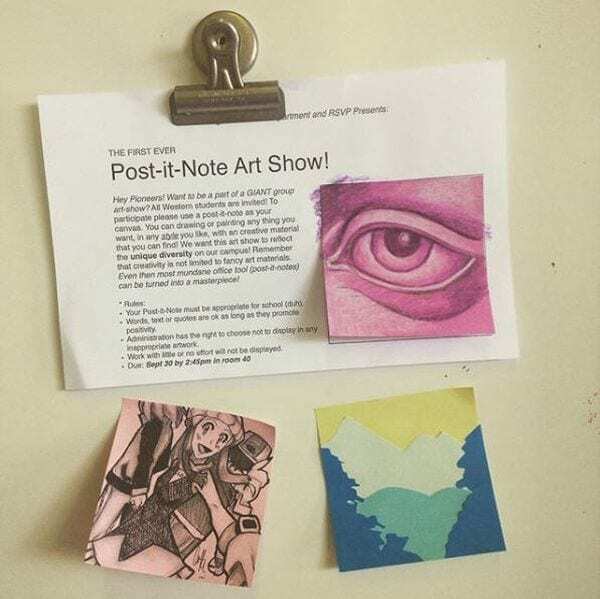 Hold a sticky note art show. Choose a wall and hold an art show! With such small canvasses, there’s no need to limit how many submissions can be displayed, and the creative options are endless. 11. DIY a lesson-plan book. End the expensive search for the perfect lesson planning book … just make your own! The Wise and Witty Teacher walks you through the steps at the link below. 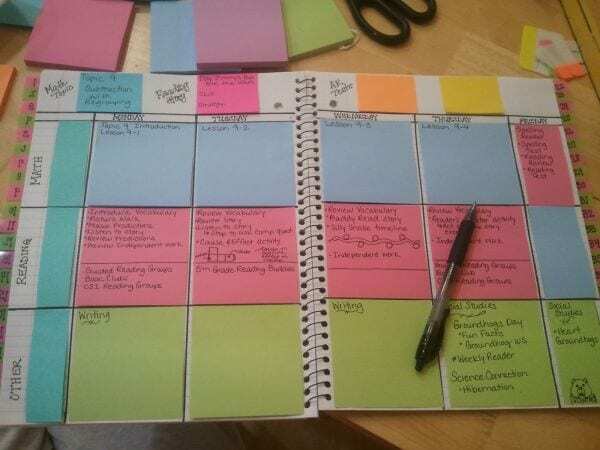 You’ll turn an ordinary spiral notebook into a customized planner. Amazing! 12. Create a story map. First, make a reusable story map anchor chart. 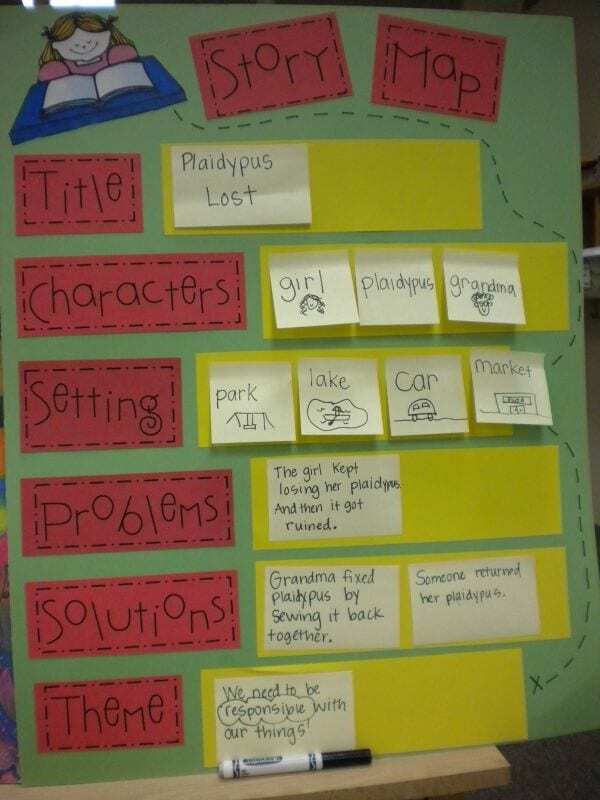 Then, use sticky notes as you map out the story’s characters, settings, theme, and more. 13. Mark text for close reading. Close reading involves marking the text to help kids read for purpose. But what about when it’s a library or school-owned book, and marking it up just won’t do? That’s when sticky notes save the day! Use different colors for different concepts and write notes as needed. Get a free printable bookmark to help with close reading at the link below! 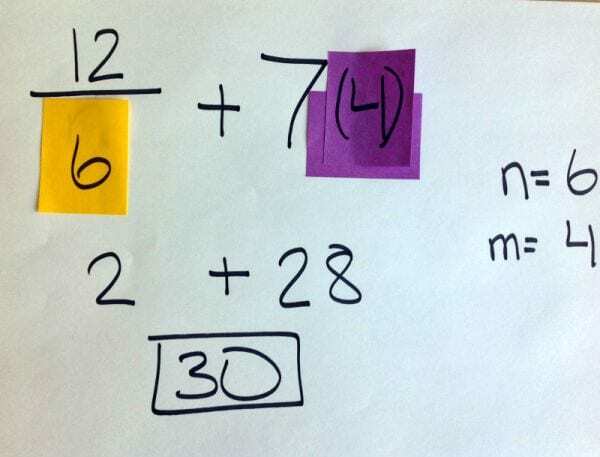 If your students are having trouble grasping the idea behind substituting numbers for variables, sticky notes can help. Just write the numbers on the notes and stick them into the equation where needed. 15. Review using Connect Four. Turn pre-test review into a game! Break students into teams. Each right answer gives them the chance to place their color on the board, in a race to see who can connect four squares first. 16. Draw sticky note portraits. 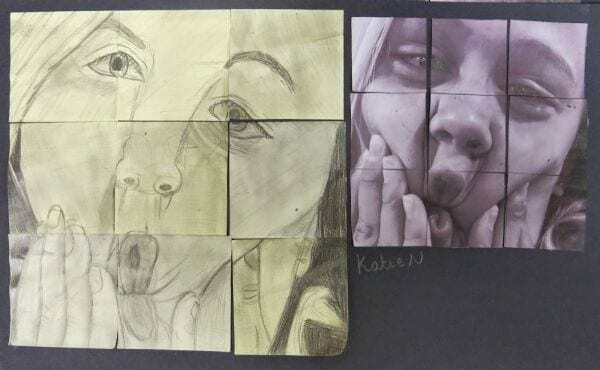 In this twist on sticky note art, students practice drawing to a grid, using individual notes. For a bit of surrealist fun, they can mix up the notes when they finish! 17. Indicate when help is needed. Give each kid a red sticky note, a yellow sticky note, and a green sticky note. They can stick corresponding sticky note on the side of their desk during independent work time to show you if they’re struggling or succeeding, without speaking up and interrupting others. “Carry the one” can be a tricky idea to grasp. 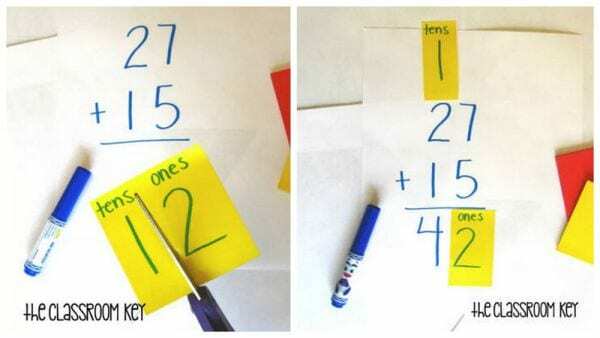 Make the visuals easier to understand with a sticky note and a pair of scissors. 19. Put up a parking lot. No need to pave paradise … a simple piece of chart paper will do. 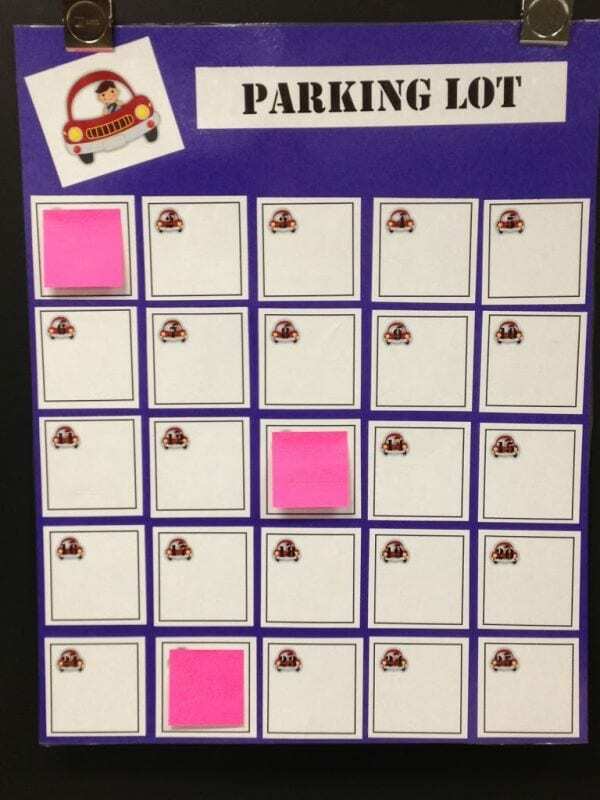 Use sticky notes to “park” questions that will be answered later or need some research. 20. Construct a sticky note clock. 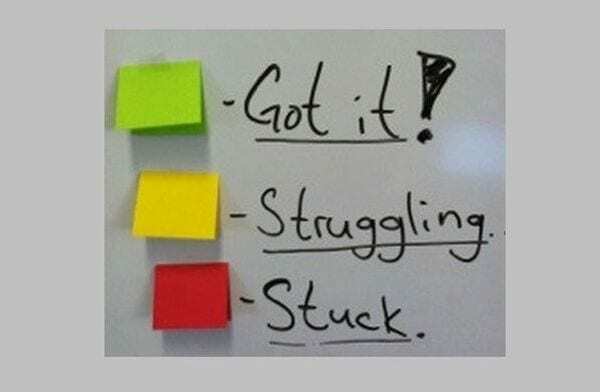 Tired of hearing “What time is gym class?” and “How much longer till lunch?” Use sticky notes instead of numbers and change as needed each day. 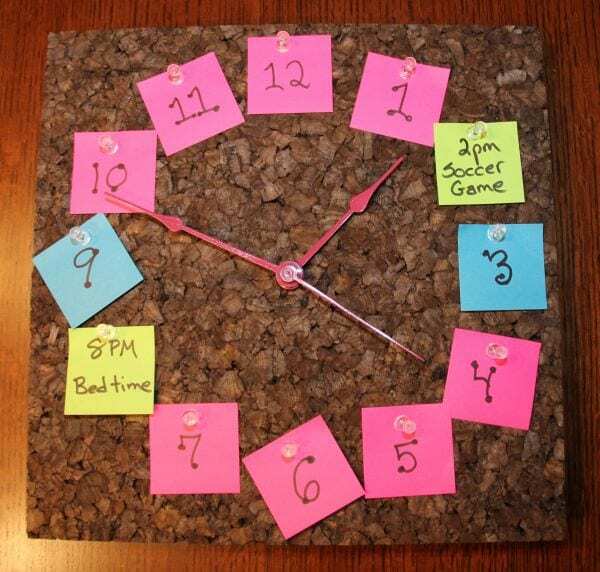 Make your own clock using a clock kit and cork board as shown or buy a simple model. 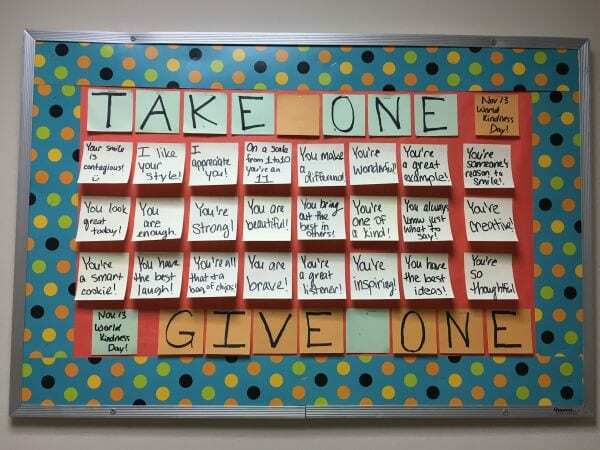 Such a simple way to encourage kindness among your students every day. 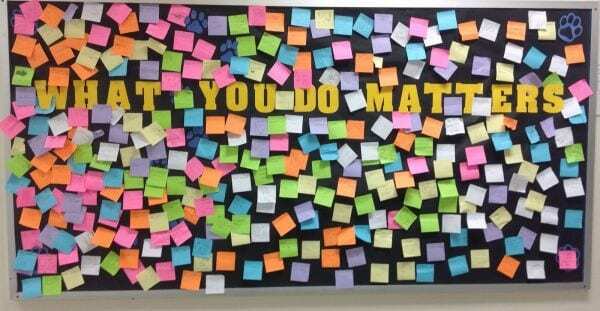 Write thoughtful notes and stick them to the board for others to take and pass on. 22. Offer a mystery reward. 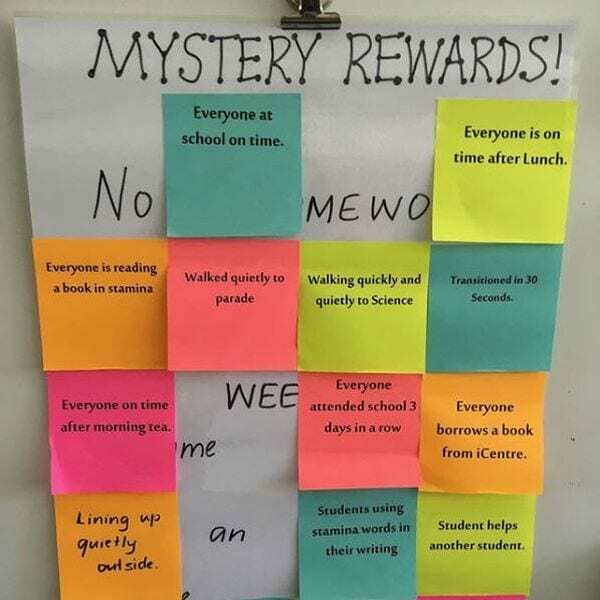 Write a mystery reward on a piece of paper, then cover it with goals written on sticky notes. As each goal is achieved, remove the note to reveal the reward! 23. Write a collaborative card. 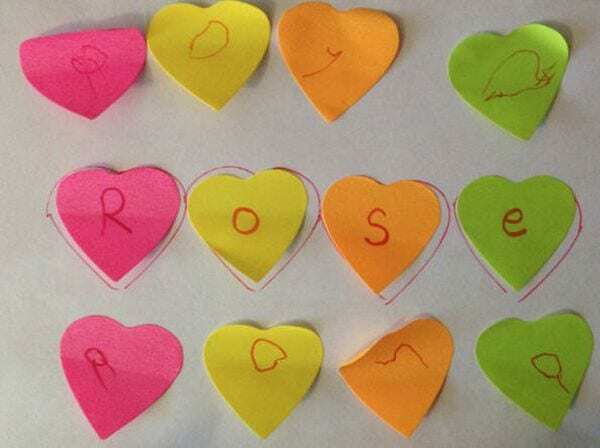 Want to send a thank-you note to a classroom visitor or a message to a sick classmate? 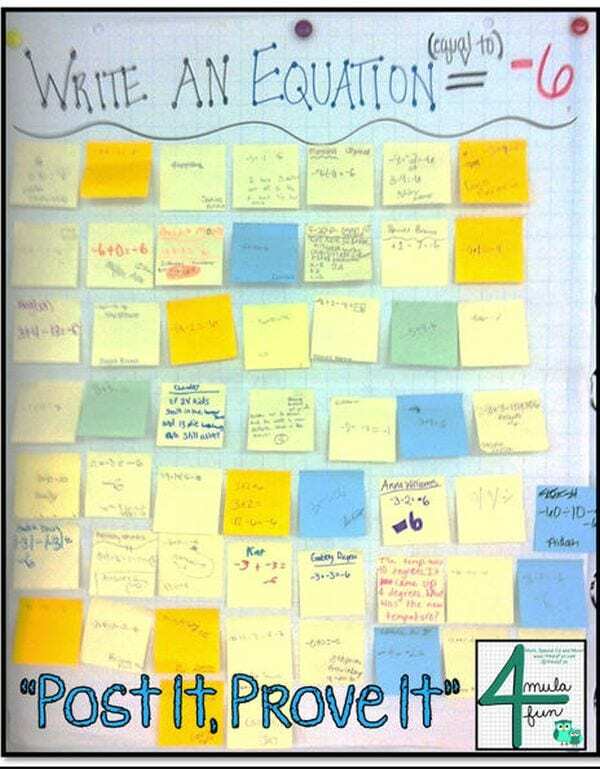 Instead of individual cards or passing around one for all to sign (“What if I make a mistaaake?”), have students write their messages on sticky notes and assemble them into one card. 24. Remind them what matters. Ask students to help come up with ways to make their school the best it can be and post them to a board for all to see. 25. Reflect on the day’s learning. 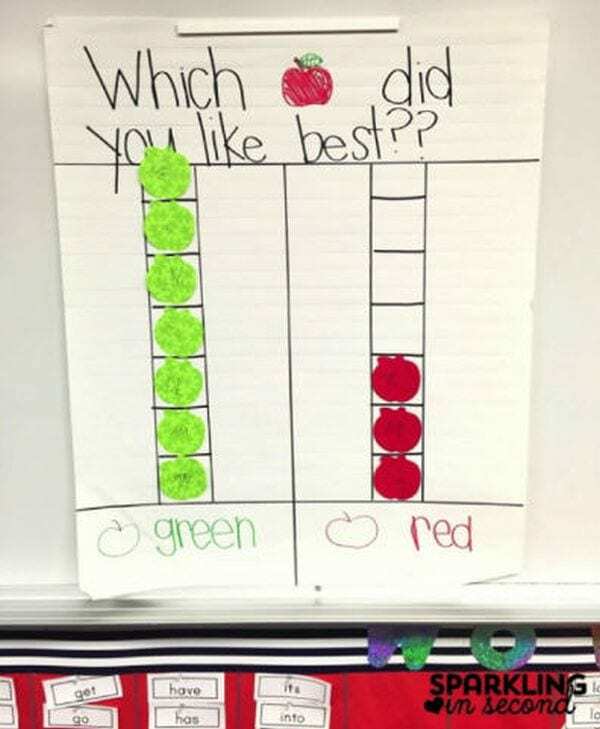 Use this clever anchor chart idea to reflect on the day’s lessons and experiences. Ask each student, “What stuck with you today?” and leave it up as a reminder for the following morning. 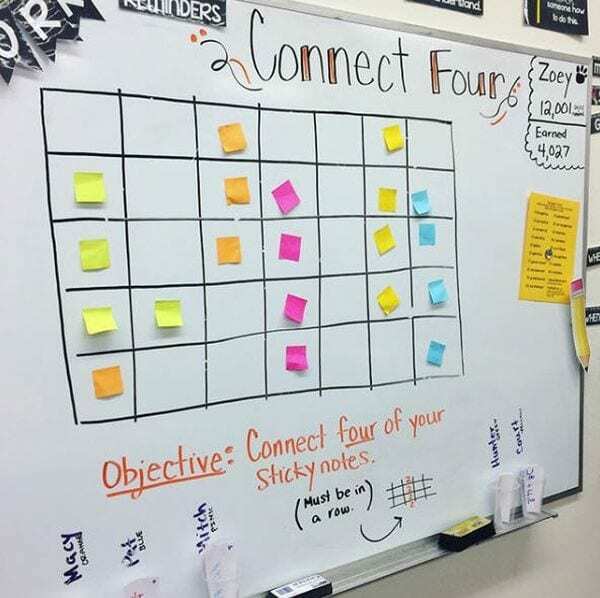 How do you use sticky notes in the classroom? Come and share your ideas in our WeAreTeachers HELPLINE group on Facebook. Plus, check out our favorite dollar store hacks for the classroom.